Maddy McVicar of the University of Maine drives in for a layup past Stonehill defender Kelsey Shaw during Saturday's basketball game at the Cross Insurance Center in Bangor. The University of Maine women's basketball team has received contributions from three instate players this season, including Parise Rossignol of Van Buren (second left), Maddy McVicar of Calais (center) and Sierra Tapley of Bar Harbor (right). Former Maine high school standouts Tapley and McVicar have happily accepted their roles as reserves for the Black Bears. 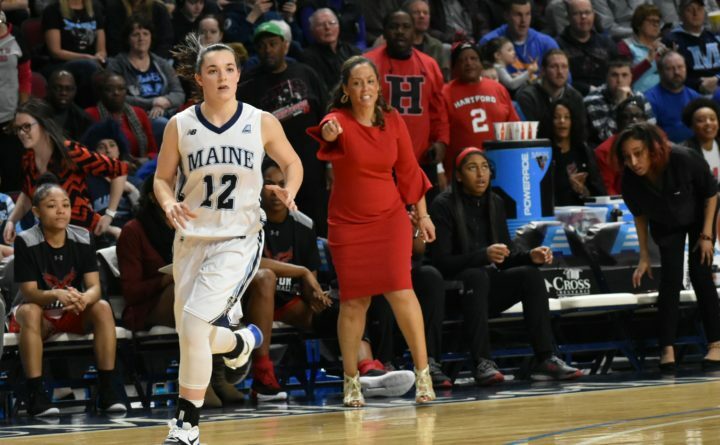 Parise Rossignol of the University of Maine (left) is pointed out by Hartford coach Kim McNeill during the America East championship game March 9 in Bangor. Rossignol, a senior guard from Van Buren, hopes to return next season as a graduate student for her final year of eligibility. ORONO, Maine — Last St. Patrick’s Day, three women from small Maine towns played for the University of Maine in Austin, Texas, against eighth-ranked Texas in the first round of the NCAA tournament. The Black Bears had earned their first NCAA berth since 2004 by winning the America East tournament, beating Hartford 74-65 in front of 3,373 at the Cross Insurance Center in Bangor. Texas was too much for the Black Bears, winning 83-54, but Parise Rossignol of Van Buren, Maddy McVicar of Calais and Bar Harbor’s Sierra Tapley had an experience they will always cherish. This season, they hope to help the Black Bears defend their AE title and earn another NCAA tournament berth. 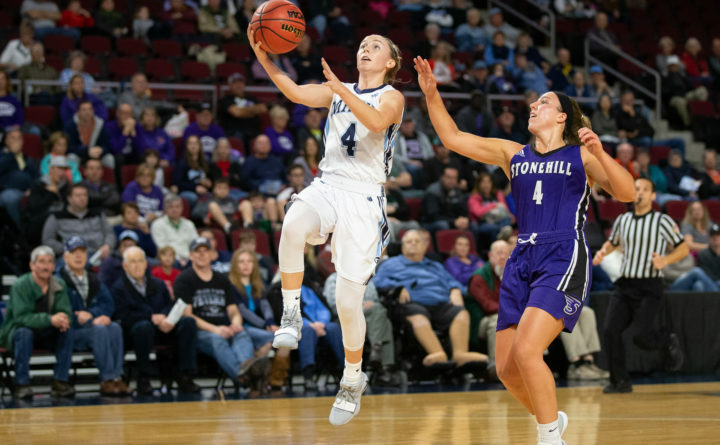 UMaine rolled by Division II Stonehill College 85-46 in Saturday’s exhibition game in Bangor after losing to the Skyhawks 68-49 a year ago. The Black Bears host Toledo at 1 p.m. on Saturday in their regular-season opener at the Cross Insurance Center in Bangor. The three Mainers have received plenty of positive feedback from people across the state about last season’s accomplishments. “We have the best fans around. They appreciated it as much as we did,” McVicar said. Rossignol said UMaine fans have been an important part of the program’s rebuilding process. To be able to finally finish it off and win the title in front of a record crowd was very special,” Rossignol said. “The state fell in love with the team and got to know the kids. It was a great experience,” head coach Amy Vachon said. But the 2017-18 season is now in the rearview mirror, and the Black Bears have been picked unanimously to defend their crown by the league’s coaches. “We have people coming back who didn’t play much last year, and we’re going to need people to step up and play a lot bigger role this year. It’s going to be exciting to see,” Rossignol said. UMaine returns six of its top seven scorers although one starter, guard Julie Brosseau, the team’s third-leading scorer (11.3 points per game), decided to transfer to the University of Utah. The two new players are 5-11 Turkish guard Doga Alper and 6-2 Slovakian forward Alex Bolozova, a transfer from Murray State Junior College. 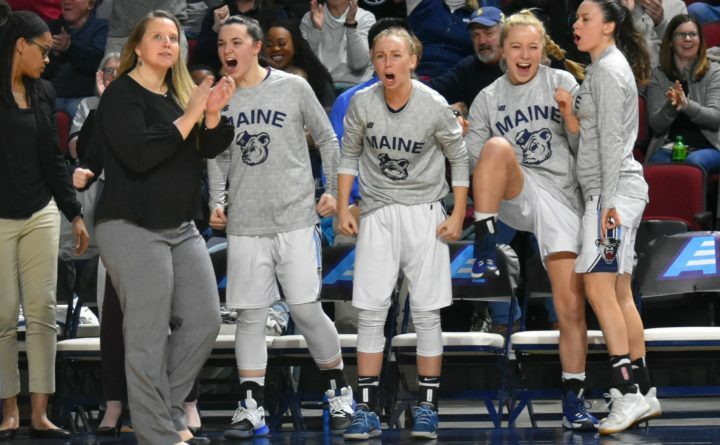 UMaine’s returning starters include first-team All-AE guard and All-Defensive Team pick Blanca Milla, the tournament’s Most Outstanding Player; second-team all-conference guard Tanesha Sutton; point guard and All-AE Rookie of the Year Dor Saar; and forward Fanny Wadling. Rossignol also was an all-tourney selection.